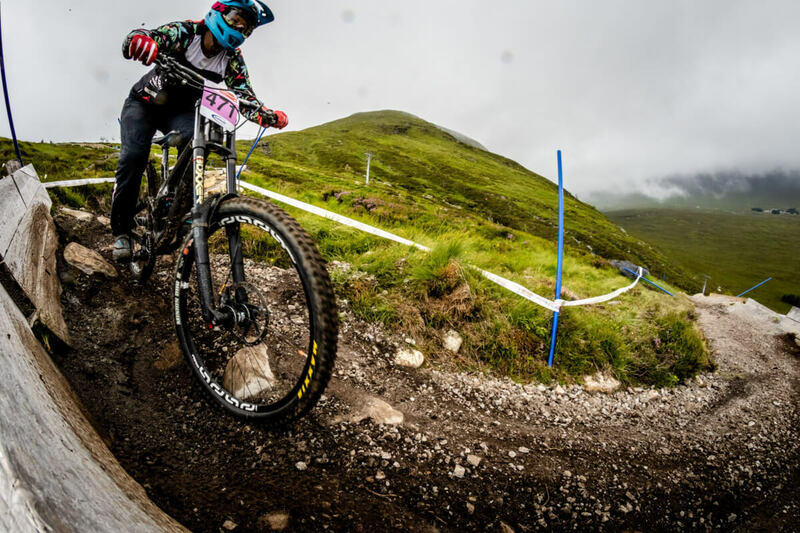 Overall it seemed a long way to go to race a track I might struggle to ride…but on the other hand the weather looked good, I like steep tracks and it was a bit of a shame if we couldn’t field the minimum 3 racers to make the category run. 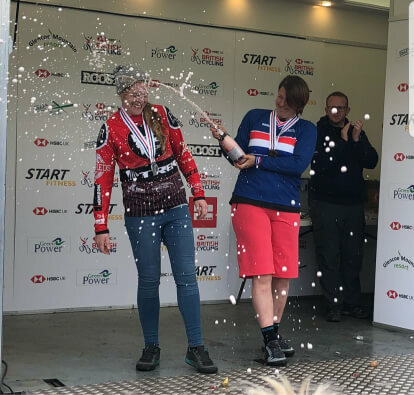 I figured I had to be in it to win it and would regret not going so after a fantastic race at the Forest of Dean Ladies do DH event I threw caution to the wind and entered with just 3.5 days to go until I needed to start that drive! I loaded my kit and trusty trail hound in to the van and set off for a long drive. Mandatory on a long journey is singing at the top of your voice for large parts of it so I hooked up my phone and settled into belting them out. Poor Charlie must have wished dogs had less good hearing! After what seemed like forever I drove across the moor and got my first view of the track. Twisting straight down the steepest part of the hill and never straying far from the line of the chair lift, almost the entire track was visible from the finish line. A walk up the track with Katy Curd and Jake in glorious evening sunshine confirmed that the track was as steep, rocky and twisty as it looked from the bottom. It was going to require a controlled mix of letting off the brakes to glide over the holes and drops whilst going slow enough to make the corners. It looked awesome fun and terrifying but I wasn’t sure if I’d ever be able to let go of the brakes and get any speed! The bottom of the track had a huge step down and 2 jumps. I was a bit intimidated by the step down and spent the whole evening worrying about it. On the plus side I wasn’t concerned about the rest of the track which actually was hard so maybe in a weird way my irrational fear protected me! I met up with Ellie the next morning for our first run of the track, neither of us had ridden it before and both of us were excited/scared to get on and have a go. The chair lift gave a great view of the track and riders having scary moments, great just what I needed to calm the nerves! The first run went surprisingly well, the bike made the track feel less steep and other than a lairy moment where things got a bit wild and out of control the track was running great. I popped off the step down and realised I could build the distance all day until I was making the landing and suddenly it didn’t seem so bad. There weren’t many places to stop on track so despite not planning to do a full run that is exactly what happened and for the first time ever at a race I only did full runs! Annoyingly one of the few places to stop on track was above the hardest section and whilst people were off the pro line they were totally in the way for anyone doing the main line leading to some sketchy moments wobbling around them at the top of a steep bouldery chute. All day the track ran well, my tyres squirmed and rims constantly dinged off rocks but I was having a whale of a time. As my confidence increased so did my speed until that inevitable moment when I let off the brakes too much, got totally out of control but couldn’t brake on the loose rocks and had no idea what to do! A last minute brake and stall into the corner saved me from hurtling off down the mountainside. I didn’t learn my lesson and 2 corners later I was getting bucked totally off line squealing and swearing at the top of my lungs leading to heckling from the riders on the chair lift above. Loving every minute of it I went back for more before calling it a day to save my arms and my poor rims. Tea consisted of sensible food and then the biggest fondant fancy I have ever seen! Anyone riding there or even driving near there needs to get themselves to the café for cake as a priority. The next morning I woke up feeling pretty good considering how brutal the track was. My strength and conditioning work with the Physio Clinic Bristol was clearly working; my strong arms held my bike through the rough lines and stopped me from planting my face on the handlebars or floor as the bike lurched through holes. I was feeling very grateful I had dragged my bum out of bed early for the last 9 months so I could go to the gym before work. The downside of Sunday morning was that the weather had changed and drizzle had blown in with strong winds. I was wary of how the track would ride in the wet but more worried about the chair lift. Anyone who has spent any time riding chair lifts in ski resorts with me will know only too well how terrified I am of them. Add in wind and the occasional stop of the lift and I was white knuckled as I got off at the top! The track was super greasy and I had a wild ride, skipping sideward over some huge boulders before grip returned and saw me on my way. With a couple of hasty dabs, an unintended wall ride and a bit of drifting I got to the bottom feeling like I’d just had a very lucky escape then I looked at the swaying chair lift and wanted to cry. The fear (completely irrational I know) set in and I couldn’t get on that chair lift for my standard second practise run. As I unashamedly explained this to my friends their faces were incredulous and I got mock slapped round the face by some gloves and told to get a grip. I refused and bravely sat in the pits cuddling Charlie dog wondering how I would get to the top for my qualifying run….. The wind dropped, the sun came out and qualifying time arrived. Then we waited and waited. Apparently a stag had chewed through the timing cable, only in Scotland! The lift swayed ominously but I made it to the top in one piece and set off on a nice chilled run. The track was grippy as the dust damped down but the rocks had dried off making for a nice controlled run which put me in first place. I hadn’t been in first place for quite some time and felt a bit underwhelmed as the realisation I didn’t want to throw it away on my race run hit home. Unfortunately Ellie crashed out of qualifying and barely able to walk was not going to make the race. There were only 3 of us in the category and I knew we needed 3 for the results to count in the championship so I hastily found a commissaire to check if it would run since 3 of us qualified but only 2 would race. The thought of having driven all that way and then not actually being able to compete for the official title was worrying but thankfully they confirmed it was fine. Less fine was the rain and wind that had blown back in. The rain lashed across the hillside and I had a miserable journey on the lift trying to keep warm and dry whilst protecting my goggles from the rain and fearing immediate death from the swaying chair lift. I finally arrived at the top and joined the other racers sheltering in the shed waiting for race runs. We watched a few riders slide out and realised the track was not going to ride like it had so far that weekend and with no opportunity to test how it was riding it was going to be an exciting race. With a feeling of trepidation but also excitement I lined up in the howling wind as the rain eased enough to make it possible that I might be able to see out of my goggles after all! Suddenly it was time to go and I attacked the track like it was dry as I didn’t have an alternative game plan. I slid out in one of the first corners landing on the only soft piece of grass for miles around. I jumped back on my bike hoping I hadn’t thrown away too much time and had a wild ride over the slick muddy rocks taking some new unplanned lines and hoping I had the skill to get myself out of trouble. I came round one of the last steep corners to see the other rider in my category getting back on her bike. I called rider and having been stuck behind riders who won’t pull over at a few other races I got a bit enthusiastic with asking her to move. She finally heard me over the wind and rain and I flew past realising the win was a couple of hundred meters from my grasp. I crossed the line knowing I’d won and bounced around a bit grinning madly. The other rider came over the line and we hugged and laughed recounting tales of crashing and wild lines. I couldn’t believe it, I had actually won, I was national champion! I launched myself at Charlie for celebratory dog hugs. I watched as the elite ladies raced down the hill and was so excited as Katy came over the line to take the main title. Matt Walker took the main mens title and getting to stand on the podium for the winners shot with him and Katy was a bit surreal. Medals and the national champ striped jerseys were given out with much spraying of champagne, ok fake barely alcoholic fizzy wine but it still counts! This was my first win for 2 years and I still haven’t stopped grinning. I might not be the fastest master female (30-39 years old) in the UK but on that day, on that track, I was. 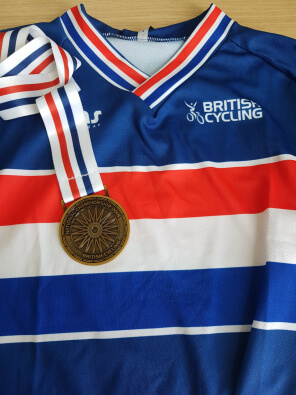 The national champ striped jersey is mine for the next year and I’m looking forward to getting a jersey with the famous union jack flagged sleeve. It still doesn’t seem quite real but I have rewarded myself with cake, ice cream, gin and champagne anyway! I can’t wait to pull on that jersey at the next race in a few weeks but until then I am looking forward to catching up on sleep and staying away from chair lifts! A huge thank you to my sponsors for believing in me and helping me get my form back after a terrible year last year. Turning up to a track like that knowing people thought I could win was a real confidence boost.